On September 24, 1961, an American Airlines jetliner overshot the runway at Logan Airport, and plunged into Boston Harbor. Miraculously, only three or four occupants of the aircraft incurred minor injuries, and were transported to local hospitals. Tragically, one man died of a heart attack while aiding in the rescue of passengers. It was a foggy Sunday morning in Boston, with poor visibility. An American Airlines flight that originated in San Francisco was attempting an instrument landing at Logan. 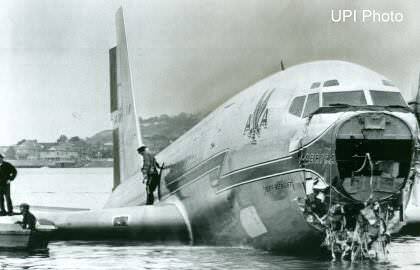 The aircraft touched down, skidded about 400 feet on the runway, veered to the right, and plunged into Winthrop Bay. The $5,000,000 aircraft came to rest in about 8 feet of water in one of the inlets of the harbor. All seventy-one passengers and crew were rescued by local citizens in their small pleasure craft. The passengers were wearing their seatbelts, and evacuation of the airplane took only about 15 minutes. Small boats pulled up to the wings of the partially submerged plane, and the passengers climbed down to the watercraft and then brought ashore. The jet sustained significant damage, with the landing gear and two of the engines ripped off the body. 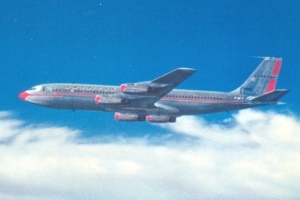 The revolutionary Boeing 707 passenger jet was first introduced in 1958. The aircraft was extremely safe, as evidenced by the above accident. The B707 truly made air travel possible to the mass public due to its size, speed, and reliability. Well into the 1990s, many 707s were still in service, although mainly located outside the U.S. in countries where noise level restrictions were less stringent, or not regulated at all.